The VT850 is a vacuum trailer for maintenance of parks, etc. Due to the sturdy structure and the big container, this is the most suitable container for communities and contractors to clean urban areas of leafs and debris. The container is short and high to keep the overall length and width small. The container tilts hydraulically and has an automatic opening tailgate. Turbine and housing are made of durable materials. 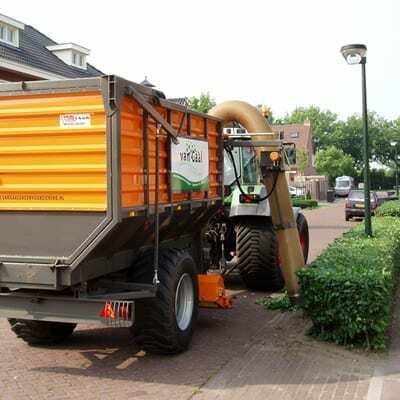 Several options are possible, like a suction hose with an oscillation system for leafs on the road sides, a funnel of 2.0 meter wide for sports fields, golf courses and parks and a scarifier shaft to scarify and clean in one shift. The VT850 is a sturdy all rounder with an extreme long life.